It's great to see EMI branching out at the moment with some slightly unusual releases, such as countertenor Max Emanuel Cencic's Rossini CD. 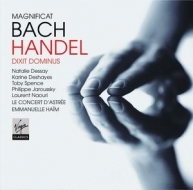 And while it's true that neither of the masterpieces on this new baroque album is lacking a reliable recording, the company is to be applauded for investing in such a worthwhile and less obviously bankable pairing as Bach's Magnificat and Handel's Dixit Dominus. The combination is complementary, showing the strengths and characteristics of each composer. Here we have Bach writing with his usual contrapuntal density (with five parts for the vocal lines instead of the usual four). He works everything out carefully and even takes the fugal writing to extremes with an archaic, unaccompanied fugue for the 'Sicut locutus est' and a more modern, dramatic one with an independent orchestral part for the 'Fecit potentiam'. Meanwhile, the Dixit Dominus shows Handel at his most vigorous and inspired. The jumping, staccato setting of the words 'Dixit Dominus' in the opening movement is a sign of things to come in this highly potent motet. Meanwhile, the solo numbers are no lesser examples of the composer's art: the vocal lines are usually extended and elegantly shaped. Although it's not filled out with further shorter pieces, the fifty-six minutes of this disc guarantee stimulation for the mind and soul. It helps to have Le Concert d'Astrée and Emmanuelle Haïm, one of the world's leading period instrument teams, on board. There's not a moment of uncertainty about the tempi, which are neither rushed nor wearily slow; and while it goes without saying that period practices such as vibrato-free playing and singing are observed, the real joy of the recording is the sense that these are as much dramatic as religious texts. For instance, 'The Lord at thy right hand shall strike through kings in the day of his wrath' is not merely a religious image; in Handel's hands it is accompanied by pulsing, throbbing sounds which illustrate it literally as well. Or listen to the setting of the line 'conquasabit capita in terra multorum' ('he shall wound the heads over many countries') in the same piece: its jagged writing could not be a more vivid treatment of this text. Haïm understands this procedure well, and all the choral movements of both works show an impeccable balance between musical consideration and expression. After having small concerns with her singing in bel canto works recently (for instance in the new recording of La Sonnambula), I was delighted by Natalie Dessay's flawless singing of the Soprano parts in this new disc. Evidently the baroque suits her, because there's an ease about the phrasing in all her appearances. Whereas I wonder if she's occasionally pushed to the limits in nineteenth-century fare nowadays, these smaller-scale pieces find her voice at its most clear and beautiful, perhaps most especially in the 'Tecum principium' of the Handel work. Karine Deshayes's singing of the Soprano II parts is by no means inferior to Dessay's. Her rich contralto quality and even intonation is well matched to the style of these works; the 'Et exsultavit spiritus meus' in the Magnificat is one of the most compelling tracks on the disc. In the alto lines, Philippe Jaroussky shows why he's one of the most promising countertenors in the world today, producing an evenness of tone throughout the voice, and tenor Toby Spence is as versatile and sensitive to the text as ever. Only bass Laurent Naouri disappoints, making very heavy weather of the 'Quia fecit mihi magna' in the Bach - my sole reservation about an otherwise outstanding recording.